Personalized Lollipops - How yummy are these? So colorful, so festive, so scrumptious. . .so big! These are the "authentic" whirly pops you had growing up as a kid. Don't be fooled by the imitation lollipops that are made in China. Our personalized lollipops are the real thing! Personalized lollipop favors are a fun treat for your guests. 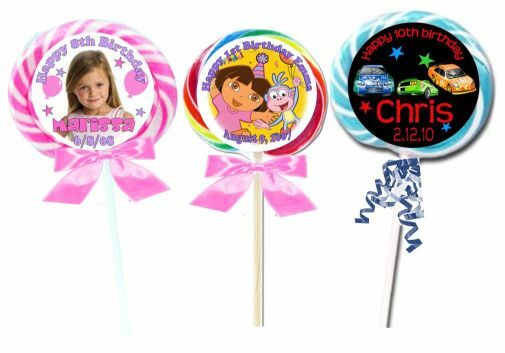 Our personalized lollipops are available in an array of designs. We are sure you will find one to reflect your personal style. A fun, inexpensive and unique Kids Birthday Party favor. A perfectly sweet ending to a perfect day! Our Personalized Lollipops can be ordered with a front label only or a label on the front and back. Each birthday lollipop favors comes finished off with festive curling ribbon or an elegant satin bow at no extra charge. Personalized Lollipop Favors Designs - View our Personalized Lollipop Designs Below - Choose from one of our Kids Birthday Party lollipop designs or let us create a unique lollipop favor label to coordinate with your Kids Birthday Party theme.